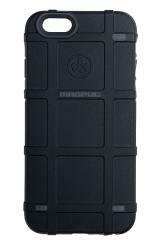 The Magpul Bump Case for the iPhone is a rougher cover designed to provide better protection for your smartphone. The Bump Case features two-material construction combining a hard protective shell with an inner shock absorbing layer, low profile side ribs for added grip, and single-piece snap-on design for easy installation and removal. The Bump Case has the benefits of a hard polymer shell and semi-rigid liner without adding unnecessary bulk. Compatible with the standard iPhone 6 and 6s.